Below are reviews, made by Daniel, of Hungarian books. In each case, the book has been read from cover-to-cover, allowing an objective assessment. Those written by Hungarians (who have a perfect command of the language but who might not have correctly gauged the mind of an Englishman) are not always as helpful as they should be. I suggest that you read all of the below, and read them in the below order too. This will give you an excellent grounding the in the language. This is a fascinating book, aimed at the complete beginner. 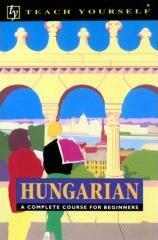 It is well-written, and gives insights into Hungarian life and culture, not just grammar. Each chapter sets-out its objectives, and begins with a reading. The new concepts of grammar in the reading are then explained. After each reading, new words and phrases are detailed in a chronological glossary. It comes with two CDs. The grammar concepts should be detailed before the reading, not after (I spent ages searching in previous chapters for concepts that I thought I had missed, whereas it turned out that the concepts were being introduced in the current chapter). The readings do not have translations. The original (~1992) version is not as good as the re-edit (~2003) version. The earlier edition's dictionary is only unidirectional (Hungarian to English). This book is a complete reference guide, it is NOT designed to be read from scratch as a course. You should read this cover to cover after you have read the other books. This book does not really explain concepts, it simply states the rules of grammar and this gives a couple of examples. It also suffers from being a linguist's book, not a layman's. For example, it explains the complete rules of the conjunctive-imperative case without explaining what it means or how to use it until many chapters later; and of talking of "final consonant gemination". This is a great beginner's book, but not a novice's book. Its teaching is clear and the examples are excellent. Despite claiming to be for beginners, it starts at a little higher level than does Pontifex's book, and goes a little further. As a complete novice you may, therefore, wish to read Pentifex's book first. For example, this book goes as far as detailing the hat/het and the at/tat/et/tet grammars. The grammar does not go as far as Whitney's 1964 gem. The book gives complete translations for the readings in the first 3 or 4 chapters, after which the pace is stepped-up considerably and no translations are given. The exercises are not as many or as varied in style as Pontifex's. The quality of the explanation of concepts is second-to-none, but like many other books this suffers from giving a reading that introduces a new concept before that concept is explained. I personally don't like this style, as it may leave the read going around in circles trying to understand (or trying to remember their non-existent understanding of) the grammar. It also suffers from introducing words that exemplify a concept but are not particularly useful in everyday (NB. "Colloquial Hungarian") conversation, such as "parrot". After the readings a useful, alphabetical glossary is given, but like so many other books it assumes that the reader has a perfect memory and does not remind him of words mentioned in previous glossaries. This means that lots of flicking to the dictionary is necessary for those with imperfect (or otherwise full) minds. At the end is a good dictionary (but unlike Whitney's dictionary it is not integrated with an index), full conjugation tables of the big seven irregular verbs, tables of examples of irregular (e.g. vowel-dropping) nouns in various cases, etc. The book has optional audio CDs but I do not own these. 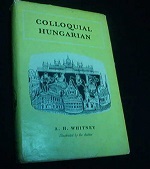 Arthur H Whitney - Learn Hungarian For English Speakers / Colloquial Hungarian. No ISBN. New York / Saphrograph co. This is a 1964 book, and not only is its content somewhat out-of-date, but its typograpical layout is infuriatingly old-fashioned. Placing items in a sequence all on the same line makes for difficult reading, separating them with carriage returns would make for much better reading. The use of quote marks is frsutrating. That said, the teaching is supurb but fast-paced. Each chapter starts with a set of notes (each numbered, and the author makes extensive use of forward- and back-references to previous notes, which is great), then a word-list, introducing new words and phrases, then a reading in Hungarian, and finally exercises. And example of the quaility of the teaching is that is differentiates between you (singular) and you (plural) without the need to use those paranthesised suffixes: it uses thou and ye. Old-fashioned but remarkably effective. The notes are discrete units of grammar, presenting a single concept per note. The word list is absolutely wonderful, giving the word, but also its root and some other examples that make use of this root. külön - apart; különös - singular; kül - outer; külföld - foreign; föld - land. mozgó kepek - moving pictures; mozog - move; kép - picture; képvisel - represent; képes - able; képez - form. It also gives related words: e.g. after the entry for szerelem - love we see szerelmes - in love, szerelmes pár - courting couple). It gives important notes about exeptions: after régi - old, we see öreg - old [man]. When the use of a word is grammatically alien to the Englishman, this this noted: it is noted after the the word mellett that this is a post-, not preposition. The readings follow two friends, Mr Szabó and Mr Fehér, during one's visit to see the other. The reading has a colloquial translation. The exercises are a series of statements and questions that must be translated into Hungarian. The book is so old-fashioned that it delays the teaching of the second person (you), and all conversations are held in the third person (he - the polite way to speak in Hungary). It waits until near the end to teach it. This means that until chapter 40 one does not know how to address one's best friend! The book's subtitle is "Colloquial Hungarian", and it is true to its word. However I would prefer if translation of the readings and exercises were NOT translated colloquially, but literally (with a general translation in parentheses). In my opinion it's more helpful to the learning of grammar to see the literal translation. It also omits to explain why a verbal partical splits from its root.